I understand not everybody is into basketball, or even sports for that matter. 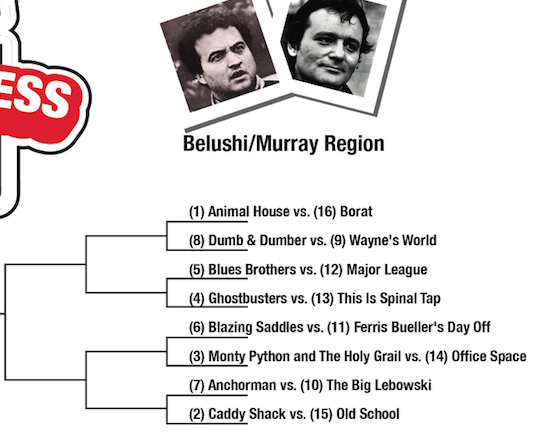 So for the past few years (with the help of some awesome people), I have released a TV Madness bracket for the masses to vote on. Dexter vs. The Wire, Friends vs. How I Met Your Mother, Breaking Bad vs. Mad Men, Game of Thrones vs. The Walking Dead…It was a good time. This year we’re switching things up and moving from the small screen to the silver screen. Movies from several genres and eras…there’s certainly something for everyone. We’ve also added 2 Play-In Games to expand the field to 68, much like the NCAA Tournament. Voting for the Play-In Games will start HERE tomorrow (3/25) morning. The REAL THING will begin 3/26 and voting will be open till 11 PM CST each day. Obviously everything is subjective with the seedings, but let’s take a closer look at each region for you to start making your picks! Like Explosions? Gunfights? Epic oneliners?…What do you mean “No”? Get the hell out of here! This is the kind of “funny” Henry Hill was referring to when he pissed off Pesci in Goodfellas. 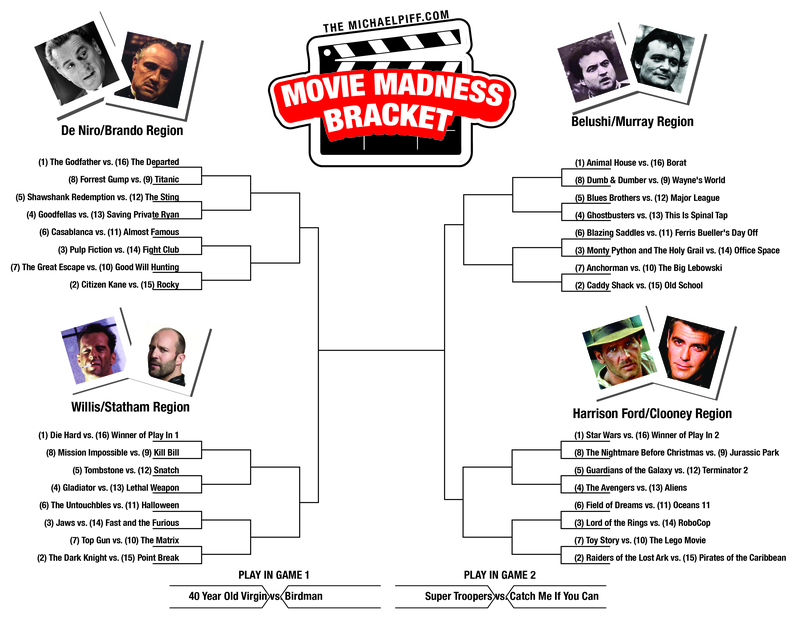 Had to give John and Bill the region’s title considering they star in 4 of the above films. This region is a fun mix for fans of adventure, fantasy, and other miscellaneous awesomeness. Yes, I understand “Harrison Ford” is the only one to get his full name in a region…but when have you ever referred to him by just his first or last name? He also stars in the Top 2 seeds. 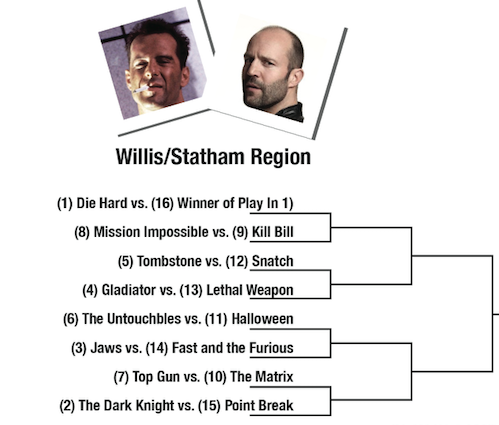 Check in tomorrow morning (3/25) as voting for the Play-In games will begin. 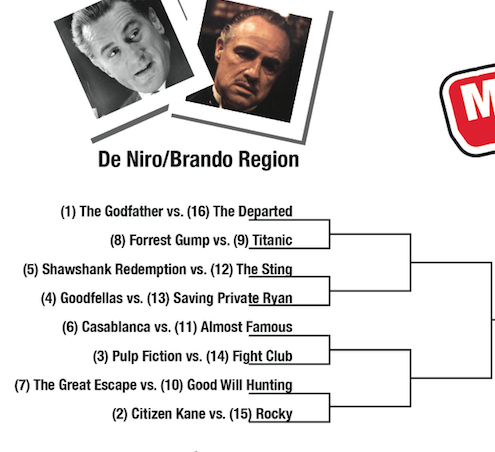 Votes on Twitter directed to @Mike_PiFF03 with the hashtag #MovieMadness will also be counted. 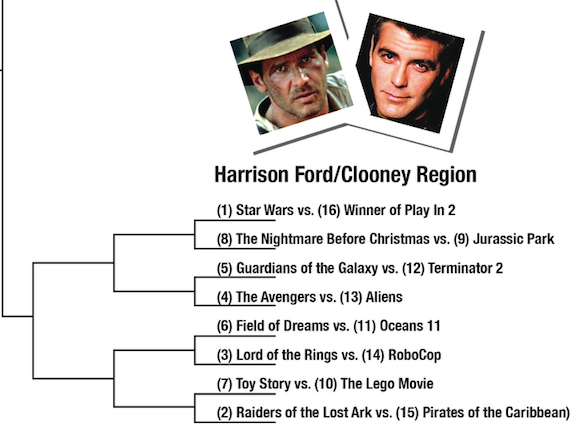 Feel free to fill out your own copy of the bracket and Tweet it to me to be shared.